"To the Stars, Through Hardship." This webpage's purpose is to provide general information about the Federation starship USS Constellation. The Constellation-G was commissioned on Stardate 120109 (09 January 2000/2412) as a Kirov-class Heavy Cruiser in Green Fleet under the command of Captain Demis Paraskevopoulus. From December 2412 onward, command of the USS Constellation rests with Captain Patryk Rychman-Sabre. If you are interested in more information about the Constellation, please contact Scott Freligh, who plays Captain Rychman-Sabre. Inquiries regarding role playing opportunities in Green may be directed to him, or to Lezley McDouall, who plays CINCGREEN. 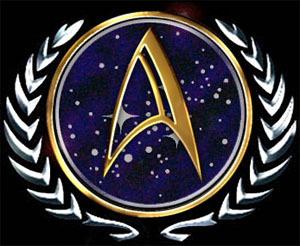 Alt.Starfleet.Rpg (or ASR) is a Usenet newsgroup on the Internet. Using email and Usenet, ASR players create an interactive fiction universe based on Star Trek: The Next Generation, extrapolated approximately 40 years after the end of the series. Players create characters and, along with other players, develop stories set around starships, starbases, and the various beings that inhabit both. ASR, founded in 1991, has grown to nearly 30 distinct role-playing units, organized into three fleets, involving over 200 players. It continues to grow and prosper. To learn more about ASR, you can visit the ASR Homepage. At this site, you can find instructions on how to join ASR in the ASR FAQ, as well as other official documents, and links to other starship homepages. This FAQ is also posted periodically on the newsgroup. This site currently maintained by Scott Freligh. These pages were originally created by Scott Lusby on 10 May 2001 and are based on work developed by Mark Palumbo, JP Balzen, Scott Lusby, Chris Aubrey, Takako Nagumo, D'Maris Coffman, Trevin Sandlin, and Jason Bostjancic.